* Sponsorship details at right. If you would like your team to golf together at the tournament, please choose "Team of Golfers". Price is $175.00 + 26.25 HST ($201.25) per Golfer. ------------------------MEMBERS: Please login to the website to enable member pricing options. Sponsor listing on all tournament promotional materials including tournament emails, Newsletter, website, and signage emails, Newsletter, website, and signage as well as reception slideshow. 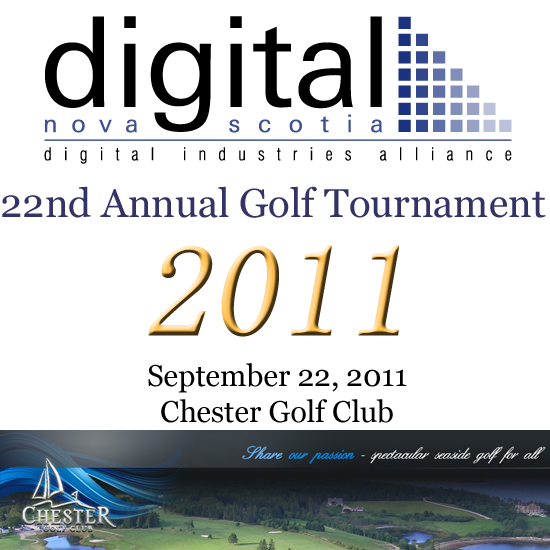 Donations would be greatly appreciated and will add to the overall success of the Digital Nova Scotia 21st Annual Golf Tournament. All donations will be recognized through your company name displayed on a label on each prize and in the reception slideshow. Don't forget, golf entry fees include a steak dinner for all golfers following the tournament!